Versatile, beautiful and full of solid wood function, the Amish Handcrafted Shaker Dining Table looks fantastic in its simple design, making it one of our top selling dining tables. Shaker style furniture like this is made to perform at the highest level without any extra frills. The apron on this shaker dining table is unique, with arched curves at each table corner. 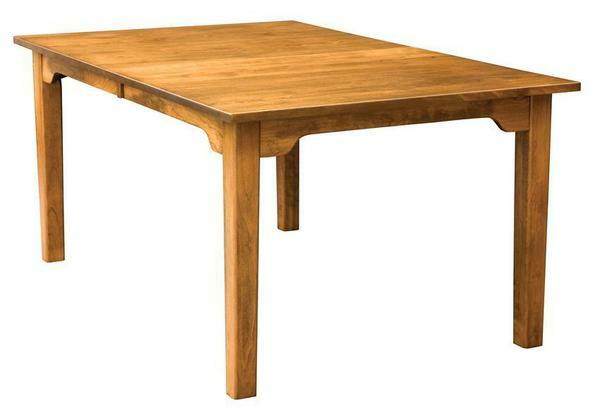 You've found heirloom quality dining room furniture. Amish made means every table leg is carefully hand sanded to perfection, the mechanics of the table are top notch and the custom options you can pick from make this table uniquely yours. Email or call us today with any questions. We thank you for shopping DutchCrafters. Just wanted to follow up and tell you how happy my Mom is with the table and your service! The repair person you selected could not have been nicer or more professional (and he was very impressed with the workmanship of the table). He did an excellent job and we would highly recommend you use him for any jobs in this area. Overall, we are extremely happy with all aspects of our experience working with you and the whole staff (delivery group included). And I’ll be ordering from you again and recommending you to all my friends!